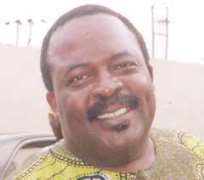 Femi Ogunrombi was, until recently, the face of Papa Ajasco, a TV family comedy. An entho-musicologist with tutelage from masters like Dr. Ademola Adegbite, Pa Christopher Oyesiku, the Late Prof. Joshua Uzoigwe, Prof. Tunji Vidal, Prof. Wole Soyinka, Kole Omotosho, Yemi Ogunbiyi and many others, he has made his mark in creative activities both in drama and musical scenes, spanning over 25 years. He is a recipient of many local and international awards, most notably in 1995 when he was awarded a gold plaque and a Diploma Certificate in Creative Composition in North Korea for performing a song in that language. It was one of Prof. Ahmed Yerima's poems he turned into a Korean song. In 2004, he was one of the nominees in U.K. Songwriting competition, the only African in his category. He is the Founder and Director of the famous Ayoro Voices, a performing choral group in the University of Ife. After starring as the 'ojigbi jigbi' head-hitting Papa Ajasco for two years, Uncle Femi, as he is fondly called, decided to go back to his first love, music, where he is busy teaching the youths how to read and write music. Amaka Agwuegbo visited his studio. A peep into his studio shows how passionate he is about music as evidenced by the state-of-the-art music equipment on display. Asked why he left the big screen for music, he said music has always been his first love and he felt it was time he made a positive impact on the youths and lovers of music. But then, there were still some production issues. “It was in the interest of Wale Adenuga Productions Company that I left. I don't feel bad about leaving, but the thing is that quite a number of viewers tended to be with the other guy, and, like I said before, they see me as an elitist Papa Ajasco. Also, considering the market target of the sponsors, they felt they were loosing viewers and money, I was nicely told and I reasoned with them and left. But after being the head of the 'family' for two years, one is definitely going to miss that family because of the camaraderie and closeness that existed among members of the family. When asked what he'll miss most about being Papa Ajasco, he said “I miss the 'family' because we played a lot and always checked up each other. Does he regret moving on? He says no as he is loving every moment spent doing music. “I'm fully into music. I produce, direct and compose songs.” This was when he went into a passionate monologue on the many things music can do for Nigeria. “I want people to know that Femi Ogunrombi is very worried about the Nigerian youths. I feel that if creative arts can be encouraged in schools, particularly government schools, our kids would be able to build a solid entertainment sector. We want to discover them early so as to train and guide them. I saw the Nigerian Board for Technical Education (NBTE) trying to formalize technical education, which is commendable. Nigeria is a land of many opportunities and we should ask ourselves why it has become a mirage to forge a truce through which different ethnic nationalities can be unified in diversity and we can encourage the youths to become conscious of this country. We should be concerned since we are all stakeholders. “I am coming up with some national songs that will encourage nationalism and patriotism, and debunk tribalism and bigotry in us. I want to believe that all hope is not lost for our country and we can re-orientate ourselves through national songs. With the many musicians Nigeria has, and many more springing up daily, what is the use of learning music formally? He says why. “The basic thing is that they know nothing about music, but are just using their talent and they seem to be satisfied with the fact that they can sing. That is why Nigerian and African music seem to be so powerful and loud in Africa, but can't be read abroad. The problem here is that there are few hands to teach many minds. Ogunrombi said he brought this poser to the notice of the NBTE Technical Committee chairman that visited PEFTI. Another problem is “I have tried to teach adults and I teach them like I am teaching children. Yet, he says he is not discouraged. What he wants is for government to look for ways of assisting the few experienced music teachers. “I hope that with my little efforts, I'll be able to make some progress because a well educated nation is a rich one. So, we must make some efforts at having national songs that will promote unity and love. We need songs that everyone can sing with pride.